Use the directions below to drive to the National Aquarium, or get turn-by-turn directions from Google Maps. Take I-95 South to Baltimore. Go through the right-hand tube of the Fort McHenry Tunnel (toll). Once through the tunnel, take Exit 53, marked Downtown I-395 N.
Take the left fork (downtown) and stay in the center lane (becomes Howard Street). Stay straight. You will pass Camden Yards on your left. Make right onto Pratt Street (third traffic light). The Aquarium is eight blocks on right. Park at convenient facility (see parking garage partner) or turn right into Gunther Circle for bus and motorcoach unloading. Take I-95 North to Baltimore. Take Exit 53, marked Downtown I-395 N.
Take I-70 East to I-695 South (toward I-95/Glen Burnie). Follow directions above for travel via I-95 North. Take I-83 South to Baltimore. Follow I-83 until expressway ends in Baltimore City. Turn left at Commerce Street and then turn left onto Pratt Street. The Aquarium is one block on the right. Although the Aquarium does not operate its own parking facility, Lockwood Place, our official parking partner, offers a discount to Aquarium visitors. Aquarium members receive an even bigger discount. The National Aquarium in Baltimore is home to over 16,000 animals, including sharks, birds, frogs and turtles! There are many great exhibits, including Jellies Invasion, Dolphin Discovery, Animal Planet Australia and many more. There truly is something for everyone. Visitors may tour the Aquarium up to 90 minutes after closing time. The aquarium has timed entries, so reserve your tickets online to save time. A closer look of what awaits you at the National Aquarium in Baltimore. 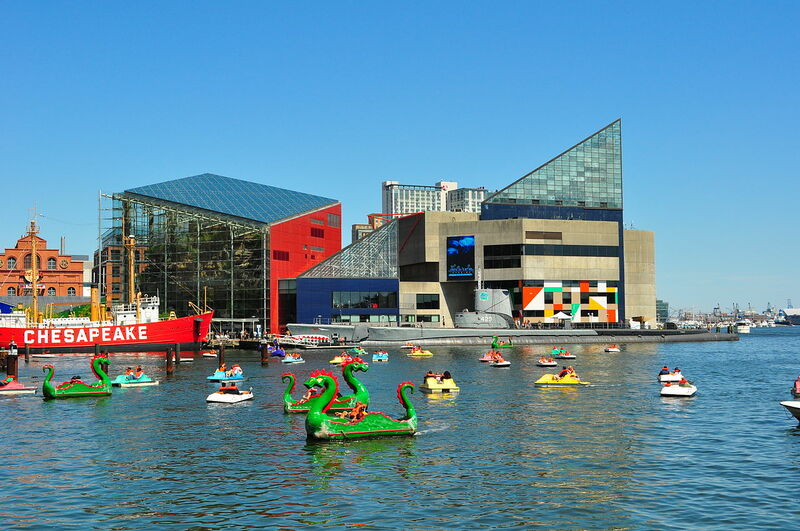 With so many things to see and do in Baltimore's Inner Harbor, be sure to get your timed ticket online to avoid long lines. Also enjoy lunch or dinner at a local restaurant nearby!